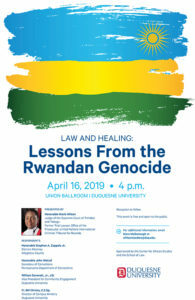 The Center for African Studies and the School of Law have teamed up to host a lecture on the 1994 Rwandan genocide from a legal perspective. The Hon. Maria Wilson, judge of the Supreme Court of Trinidad and Tobago, will present Law and Healing: Lessons from the Rwandan Genocide Tuesday, April 16, at 4 p.m. in the Union Ballroom. A reception will follow the presentation. Wilson is a formal trial lawyer in the Office of the Prosecutor of the United Nations’ International Criminal Tribunal for Rwanda. The Rev. Bill Christy, C.S.Sp., director of Spiritan campus ministry. The event is free and open to the public. For more information, contact Mara McDonough at africanstudies@duq.edu.